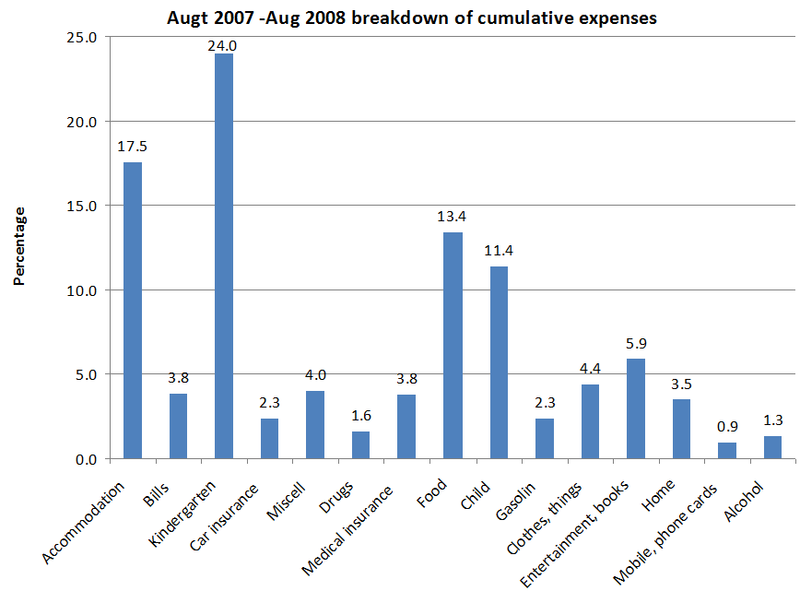 As you can clearly see, that half of the child consumes 35% of the family budget, adding accommodation and the bills – we got roughly 57% to spend on what is considered essentials. Gasoline is about 2.3 percent, so there is no point in trying to break the balls over saving some gas by slowly starting and stopping at the lights. If you save 10% of it (which is very, very high estimation) it is only 145 dollars a year. Is it worth to take away all the fun out of your life? On average it is 5133 USD after taxes a month. 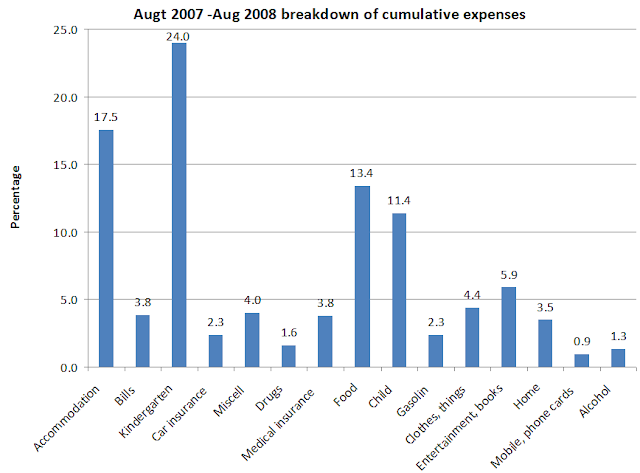 The things are considered as essentials: Accommodation – 18 %, Bills – 4% , Kindergarten – 25%, Drugs – 2%, Medical insurance – 4%, Child – 11%. Total: 65% of the budget is out of our control. I have to confess, that it is not completely representative, as we haven’t been on a long vacation in that period and with Virgin islands and Canyons next year (August 2008-August 2009) entertainment budget will be bigger. But we hope that we will manage to stick to the same annual expenses of $ 62 K.
Keeping the record is very interesting and useful, as when gas reached $4 a gallon we started spending $120-130 a months, instead off $80-90. So there was no panic. Additional $40 a months out of 5000 dollar budget it is less than 1%. Again, of course it affects other prices as well, but not to a great extend, in our case. In that period we managed to save about 40% of our after tax income, which is good, but as we have to relocate every a few years in a search of new job, we consider it as a minimum due to the uncertainty with the income and employment.